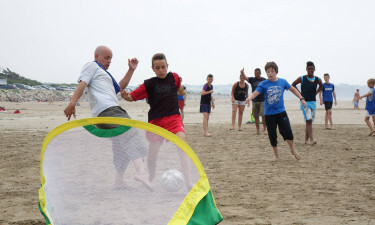 For a double dose of fun and adventure, come to Domaine de Ker Ys! 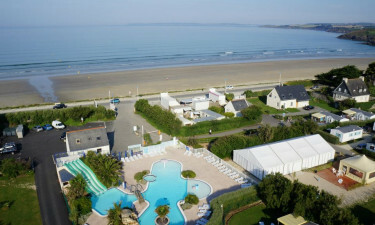 Just outside the resort of Saint-Nic and 20m away from the sandy Pentrez beach in Douarnenez Bay, the luxury camping site of Domaine de Ker Ys is the place to come for a family holiday filled with excitement on water and dry land. Why stay at Domaine de Ker Ys? With its waterslides, waterfalls, mushroom fountains, toddler’s area and whirlpool, the huge lagoon pool has something for everyone. There is a spacious terrace with sun-loungers for relaxation and aqua fitness classes for all to join. For a more serious workout, adults have access to Hom'Sport, the gym and cardio area. Football and basketball can be played on the multi-sports court and there is a pitch for leisurely pre-dinner games of boules. The children’s play area has see-saws and swings, and in high season the campsite organises fun activities for kids on the beach. For a luxury camping treat there is the spa complex, Hom'Spa. Pentrez beach is 4km long, so there is ample space for everyone. Young children can paddle in the shallows, build sand castles and hunt for shells. Adults can swim and laze in the sun on the soft powdery sand, or try their hand at one of the many exciting water sports available. Surfing, body boarding and kitesurfing are just some of the thrilling options on water, and for an adrenaline rush on land try land yachting. Nature lovers will want to explore the caves that dot the rocky coastline linking Pentrez to the inlet of Caméros, whilst the cliffs offer spectacular views of the bay. For a day of hiking, Armorique Regional Park is just 12km away and has some of the most breathtaking coastal scenery in all of Brittany. Carnac is famous for its ancient stones and has a fascinating museum. The lovely town of Auray has a lively weekly market and the ancient Saint-Goustan port area with its waterside restaurants is the place to go for amazing sea food. Douarnenez is just 13km away and is a larger port town with sandy coves and great restaurants, bars and cafés. 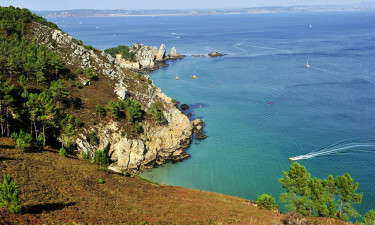 For a glimpse of paradise, take a boat trip from La Trinité-sur-Mer to Brittany’s famous islands. White sands and turquoise waters await your discovery. There is a crêperie on-site and a choice of restaurants and bars in Saint-Nic. There is a bakery service. All other luxury camping essentials can be found in Saint-Nic.